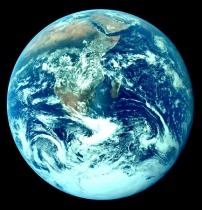 Earth, the third closest planet to the Sun, is also the only known planet that supports life. The atmosphere contains 78% nitrogen, 21% oxygen, and 1% argon. The atmospheric layers are - in order of distance from sea level - the troposphere (10km), stratosphere (45km), mesosphere (80km), thermosphere (200km), and exosphere (400km). The Mir Space Station previously orbited at 365 km above and the space shuttle orbited at 260 km. The ozone layer, an important shield keeping out the more dangerous UV radiation, is situated 50 km above ground level. The high-energy UV rays hit the ozone particles (O3), causing them to break up into oxygen (O2) and monoxide atoms, which rejoin to form O3 again. This constant cycle keeps out the dangerous radiation that can cause skin cancer and melts the polar ice caps. However, because of pollution - the release of chlorofluorocarbons into the atmosphere - a hole has appeared in the ozone over the polar ice caps. CFCs approaching the equator are sucked up high into the atmosphere, circulated over the entire globe, and eventually congregate at the poles. These stable chlorine molecules react with and make inert - at worst gradually destroying - the ozone. The crust is up to 70 km thick and starts only 6 km beneath the ocean, where the temperature is approximately 1050°C. The next layer, called the mantle, is 2900 km thick with a base temperature of approximately 3700°C, though high pressure keeps it rock-solid. The 2,200°C outer core is 2000km thick and made mostly of liquid iron. Finally, the inner core is 2740 km thick and consists of solid iron and nickel. The temperature at the core is approximately 4500°C. The crust is made of many vast 'plates' that are constantly moving very slowly. Where two plates touch is a 'fault', which is responsible for creating new islands - via the release of molten lava into the water - when located just beneath the ocean. Mount Everest, Earth's highest surface feature, reaches up to 8 km above sea level. Oceans cover 71% of the Earth's surface. It is from these waters that life first emerged, which in turn, it is theorized, was brought to the waters by asteroids during the early days of the solar system. We don't know if intelligent life exists elsewhere on other planets. Many people believe that Mars is home to some bacteria and that perhaps some life forms can withstand Venus' high temperatures. But there are millions of stars in our galaxy and millions of galaxies in the universe. And while the universe is 13.7 billion years old, the human lifespan rarely exceeds 110 years. The Earth may be a pinprick in spacetime, but it also hosts what may be the loneliest yet most intelligent life forms in the universe - Homo Sapiens.